Bruce Banner was a strain we started to develop back in 2010. 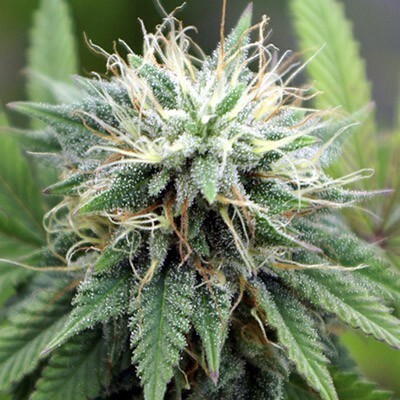 We shipped 500 seeds to a sophisticated grow warehouse owned by a leading medical marijuana dispensary in Colorado. They were treating patients in some serious chronic pain and they asked us to donate 500 seeds of the most potent pain killing strain we had. They were looking for a Hero strain that would come to the rescue for all those suffering patients. We had a Sour Diesel with outstanding terps crossed with Strawberry Cough and a bit of OG Kush. This strain was in Beta development, growing using bat guano as organic fertilizer. Since it was a strain coming to the rescue for those suffering and it was growing using bat guano, we jokingly decided to call her Bruce Banner. This strain would later be known as Bruce Banner #1. 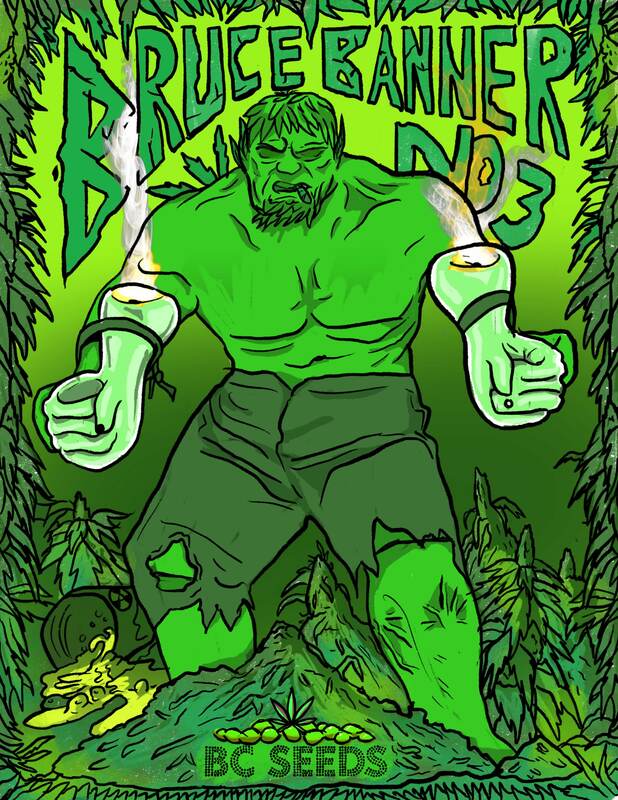 Tag: Bruce Banner No 3. Colorado had been working with Bruce Banner #1 using their top breeder, focused on Pain Killing effects that didn’t leave the patient drowsy. 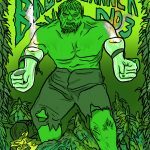 They just played a numbers game with the original 500 seeds we send them of Bruce Banner #1. They chose the strongest female and the tallest male plant out of all 500 seeds. And all 500 germinated, the dispensary was impressed with our free donated seeds to say the least. Out of the 500, 331 were female and 169 were male. Choosing the female with the most THC Crystals gave it’s pain killing effects, and choosing the tallest male passed along some fine haze CBD traits to produce the perfect combination of pain killing effects that keeps you mellow but not tired. Imagine being mellow with energy and no longer in pain. It’s really is a Super Hero bud, and we call her Bruce Banner #3. We hope she’ll be your bud and come to your rescue soon. 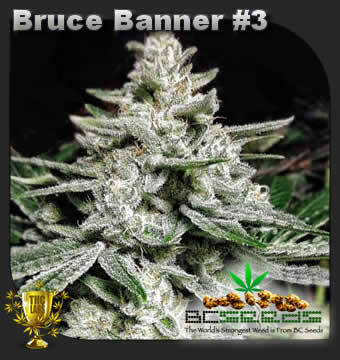 Bruce Banner No 3 won many awards these past few years, even the strongest strain on Earth in 2013. Her THC level may not be up to 2016 standards, but that’s because she’s got very CBD, and those in the know, know it’s not all about THC. You gotta have the right combination to get the right high. Too much THC and you’re a useless, speechless couch potato. Too much CBD and you don’t feel high. But imagine 31.34% THC and 8.38% CBD, and you’ve got a winning strain that’s hard to keep in stock. This is a great strain for making hash, hash oil and especially ghee for baking edibles. My seeds arrived with my freebies as promised. I love to smoke a bowl then binge watch Gotham. I just puff slowly over hours for my personal way to enjoy this potent strain, slow and steady. Bruce Banner #3 was easy for me to grow outdoors in Queensland. I’m surprised she handles our climate. I’m keen to try Pot of Gold next, it’s getting popular here in Australia. My seeds arrived to my Detroit home. Thanks for the speedy service, they arrived quicker than I thought they would.